1. It is so hammy, so cheesy, so schlocky, so poorly acted, so amateurly choreographed, so Pinewood Studios sound-staged, so Nancy Meyers lit-like, and so cringe-inducing that I often felt genuine embarrassment for the actors gullible enough to allow themselves to get cartwheeled into and tangled up in this goofy net. 2. It is so frivolous, so fun, and so outrageously out there (Rocky Horror Picture Show is 'out there,' not good at all, and a cult classic 43 years later!) that we enjoyed the heck out of it and laughed our tail feathers off! First, surrender to the beauty of Croatia's Island of Vis, home to the exterior shots. Second, check your judgmental, high-falutin ego and critic-o-meter at the door. 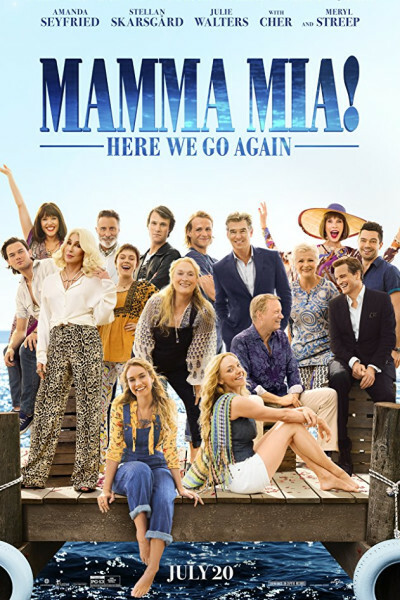 Third, think of it like coffee with old friends, served up by Rita Wilson and Tom Hanks with Amanda Seyfried, Andy Garcia, Cher, Christine Baranski, Colin Firth, Dominic Cooper, Lily James, Meryl Streep, Pierce Brosnan, and Stellan Skarsgård. Some of them may be saggy-jawed and bursting at the seams now, but aren't we all? Fourth, embrace the Abba shtick (including new songs! ), the wigs, the blue jean overalls, the spandex jumpsuits, the bedazzled bell bottoms, the high heels, the feather boas, and just let yourself go. You'll be glad you did, and by the time you leave perhaps you'll even be smiling, laughing, humming, singing nostalgically, dancing, swaying your geriatric hips, crying or, at a minimum, simply relieved you didn't stay at home on the cat-haired sofa imbibing in GOT season number Who Cares Anyway and halfway through another pint of Häagen-Dazs. Come on, man, live a little!